Do you want to create a custom login form for your WordPress website? Having a custom login page is a great way to personalize the user experience and further brand your business. In this article, we’ll show you how to customize your custom login form in WordPress. Why Create a Custom Login Form? Security – Online forms are a huge target for spammers. By creating a custom login page, you can hide the default page. This will reduce login spam and keep your WordPress site secure. Branding – By placing the form on a custom login page, you are able to customize all the elements on the page around the form. This can include your logo and other branding elements. Ease of Access – You can place the login form in a sidebar widget, so that it’s easily visible to users. Once you have installed WPForms, go to WPForms » Addons and find the User Registration Addon. 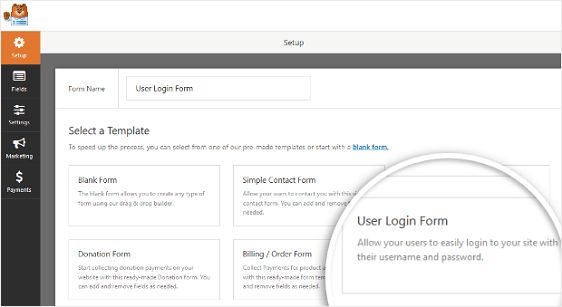 On the setup screen, name your form and select the User Login Form template. By selecting this option, much of the work of creating the form will be completed for you. 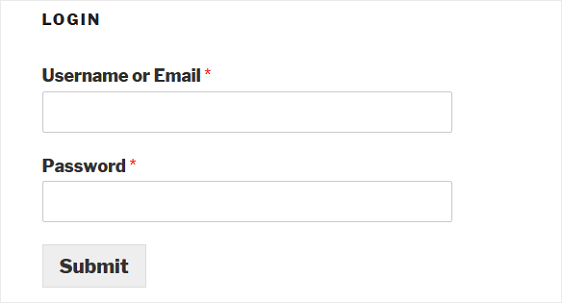 Since you’re creating a custom login form, you shouldn’t need to add any additional fields. If you want to add additional fields to your login form, just drag the fields you want from the left hand panel to the right hand panel. Then, click on the field to make any changes. Next, you’ll need to configure your custom WordPress login form’s settings. To do this, go to Settings in the Form Editor. Then, click on the General tab. 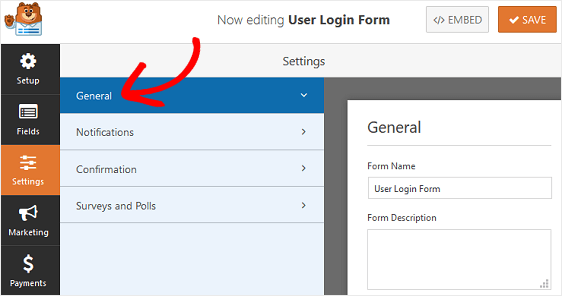 Hide the form if a user is already logged in – by default, the form will be hidden if users are logged in until you change this setting. Lastly, you can disable the storing of entry information and user details, such as IP address and User Agent in an effort to comply with GDPR. For help with this step, be sure to check out our documentation on creating GDPR compliant forms in WordPress. All you have to do is click on the settings you want. Then click Save. After you’ve created your login form, you need to add it on your site. You have two options for this. The most popular option is to add the login form on a custom login page. You can add any additional information to this page, such as a logo or text for branding and personalization purposes. Start by creating a new page in WordPress and name it Login. After that, click on the Add Form button. Next, you need to select your login form in the modal popup and click Add Form. After that simply publish your page. Your custom login page and form is now displaying on your site for visitors to see and log into. Remember, if you have the form set to be hidden to logged in users, you must log out to see the login form on a published page. You can also embed the login form in your sidebar or footer by using widgets. Simply go to Appearance » Widgets and drag the WPForms widget into the widget area of your choice. Then, select your form and click Save. And there you have it! You now know how to create a custom login form in WordPress, as well as how to add it to a custom login page for a more personalized and branded look. 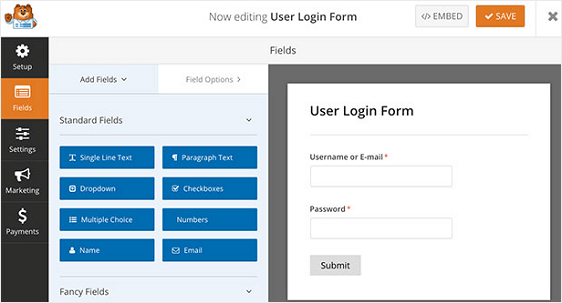 If you want to learn more about login forms for you website, be sure to check out our helpful guide on customizing your login forms to engage users. And of you haven’t already, make sure to check out how to create a user registration form for your site. These are great tools, thanks for sharing!!! I am currently creating a custom log-in page for a client. I am wondering how I would go about adding a ‘forgot your password link’ to the log-in page? Sure! Here’s a great tutorial that will show how to add a Forgot Password link to a WPForms login form. Just scroll to the section titled “2. Allow Your Users to Reset Password”. Hi, great post. I just purchased the Pro Version and have one quick question. How can I add the login button on my main menu like you have done on this site and once someones logged in change that to a logout button?? Thanks! There are a few different ways to do this in WordPress, but here’s an article from WPBeginner with a popular approach. I want to create registration form user first, can I use it for log in customer form after? means, how to link registration form to log in form? In order to set this up, you’d need to create two forms: a registration form and a login form. Then if you wanted, you could redirect the user to your login form immediately after they’ve submitted the registration form. You can set up a redirect like this within the form’s confirmation settings. After the customer logged in, how I can redirect him to his private page? I want to create this as a membership account. Each client has its own page with personal information. This page might have multiple forms to be filled out. And I want these information to be visible for him and be as a reference in every time he logged in. Based on your description, it sounds like you’re looking for front-end user profiles/user specific content. While we don’t currently offer these features, WPBeginner has a great breakdown of the best membership plugins for WordPress. After you’ve installed the WPForms plugin on your site, you’ll want to activate the license key found in your WPForms account. To get to the license key field on your website, you’ll go to WPForms > Settings > General and paste the license key from your account into the available field.